Since its introduction in October 2010 the machine has created a lot of excitement in the buyers’ ranks, mainly due to its high-quality cleaning results. 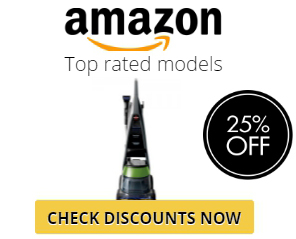 To tell more, the numerous customers’ reviews state that it shows the highest results among all the models of the carpet cleaners, including the leading ones. For the last four years, there were enough proves to support the statements. Considering the facts, we think it is time to summarize the features and discover why the model gains so much approval. 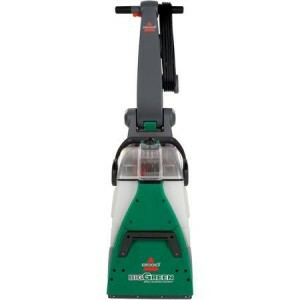 According to Bissell’s testing, the machine shows more thorough cleaning compared to the top-line models like Rug Doctor and Hoover Steam Vac. The unit uses a patented Dirt-Lifter Brushes technology, which makes the dirt loosen and lift out of the fibers. This system allows to remove even deep stubborn stains. The device can clean on both forward and backward passes. And the heat, radiating from the motor, helps with faster drying of the carpet. The actual dry time depends on air circulation and the temperature level. Some customers said it took about three hours for the carpet to be completely dry. You can set a suitable height of the handle for more convenient work with the machine. Add hot water to the tank and watch your work becoming much more effective. Filling and emptying the unit turns to be easier with two separate tanks for clean and dirty water. The feature is highly supported by customers, as the working experience becomes much more hygienic. A 1.75-gallon clean water tank is much bigger than 1-gallon in the majority of regular cleaners. In terms of efficiency, it shows even higher results than 3-gallons tank of the Rug Doctor. The information is taken from the users’ comments and reviews. Preparing for use is basically presupposes the adjustment of the handle and filling the tank with water and solution. The set-up is very simple. There are no numerous knobs, the appliance is designed to provide an easy-to-follow and, thus, effective working experience. You can monitor the water level with the help of a flow indicator. Thus, it provides an easy check and change of water when it is necessary. The device comes with an extendable hose and an attachment for cleaning stain, upholstery, and stairs. The 25-feet long cord will allow for cleaning in places that are usually hard to reach. Though the appliance is quite expensive in terms of money, it is provided with a 5-years warranty, which is a lot more than the regular 1-2 years of service support. As we said before, the results of cleaning beat up all the top-rated machines. The device shows the best value that money can buy. Not many potential buyers are ready to pay the sum around 450$, considering the fact that cheaper devices cost two times less. But one should understand what he is paying for. A 5-years warranty and the best cleaning experience among all the carpet cleaners should cost more, of course. Regular appliances can’t match the Bissell 86T3. They neither possess the same amount of power, nor the same capacity of the tank. People buy the unit because they see a large potential. The machine has nearly 42 pounds of weight. You might face no troubles pushing it around, but if you need to take it upstairs, you’ll definitely have to ask for help. As referred to cleaning the room, the appliance comes with an ergonomic handle that you can easily adjust. In this case, you won’t feel the actual weight of the unit. The company recommends using the Bissell 2X formula for the machine. It should be noted that you get 24 bottles of solution with the packaging. Depending on the area of work, one might need more, as the best cleaning experience is achieved through the use of detergent. The manufacturers also state that using a non-Bissell solution may result in damaging the device. Thus, constantly paying for the detergent leads to extra spends and a slight impact on your family budget.